There was only one way to go when we left Douz – across the Chott el Jerid. 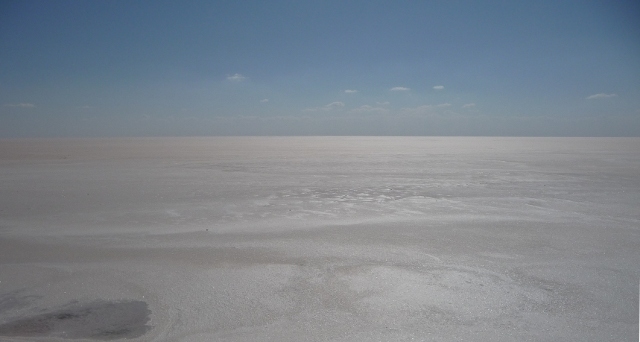 Shown on maps as a lake, for eleven months of the year it’s just a flat salt pan, extending 100km east-west and 50km north-south. Apart from a road, built by the army and raised above the surface of the lake bed, there is nothing there (if you don’t include the string of cafes along the road, all of which had a selection of salt sculptures of varying success). Along the northern edge, red mountains climb above their reflections – except they aren’t reflections, merely mirages as the heat on the flat surface bends light and tricks the eye. 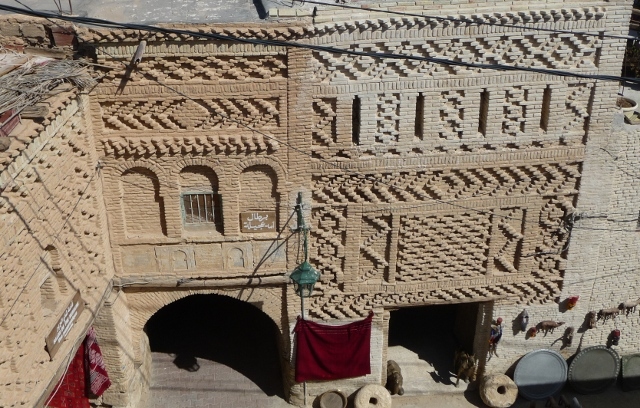 Once across, we entered Tozeur, again with the ability to choose a campsite – one of which we’d heard was excellent. Eventually, we found it – but were gently bewildered at the size. More than three or four vehicles would have been a squeeze in what appeared to be the car park for some (albeit very nice) cabins behind the owner’s house. There was, we were quickly told, more space in the “other part” of the site down the road – and we were welcome to go and look, but he suggested this area was the better. We had a look anyway. There was indeed plenty of space – so much that the front half had been rented out for use as a gas bottle storage and distribution yard. After we squeezed back past the articulated wagon being loaded, we decided to keep looking. The various lists we’d found suggested there were as many as three other campsites in town – but it turned out that they were all one which kept changing management and name… It wasn’t bad at all – but there was no hot water. The plumber was arriving the next day, insh’allah – but, even then, it was a bit of a trek out. So we headed back to the small site, prepared to treat it only as a one-nighter. Somehow, and despite our guidebook’s warnings that it’s touristy, the town grew on us quite quickly, and we ended up staying for five nights. Famed for the decorative brickwork of the buildings, the old quarter is beautiful – and very different to the other old towns we’ve wandered through. Most of the tat-emporiums catering to the souvenir requirements of the Zone Touristique residents have been kept out of the old quarter, and whilst there were groups being route-marched through, it was mostly quiet but for local residential life. Small children broke off from their games to hail you with a friendly “Bonjour”, quickly followed by “Donnez-moi un stylo!”… Old women shuffled around in traditional dress, totally covered in a black cloth with a single white embroidered stripe. 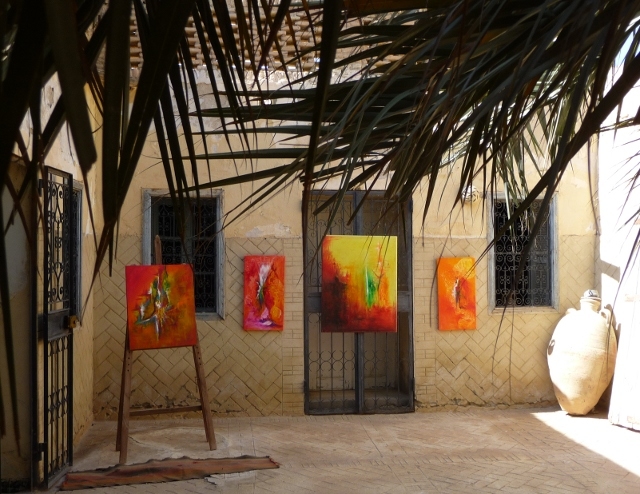 We wandered into one house, signed as an art gallery – home, workshop and display space to Raoudha. We admired her art (as well as the setting!) before being invited to sit down with a cup of tea, and a long chat followed – interrupted by the full-blooded cry of the Muezzin from the nearby Mosque. Not, though, the call to prayer – it turns out that round these parts, they fill-in the gaps by broadcasting public announcements – everything from births, marriages and deaths through to lost property. 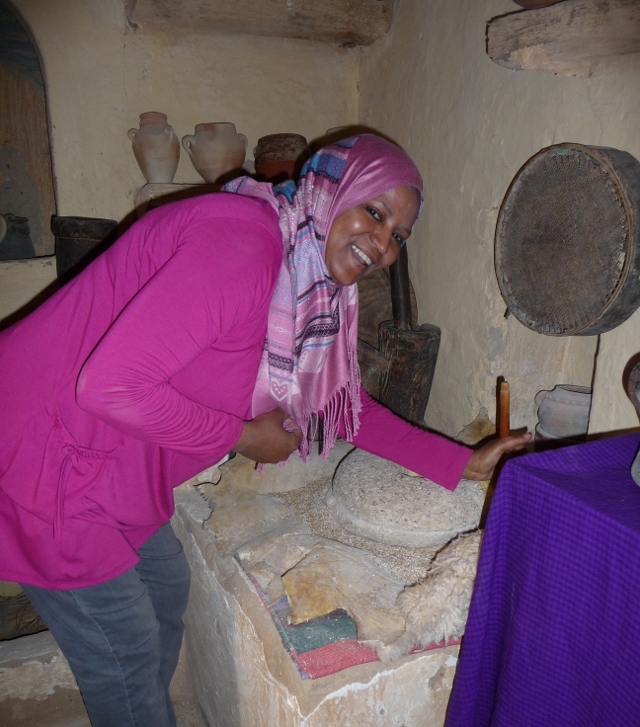 Opposite, an old Zaouia shrine had been converted into a house-museum. 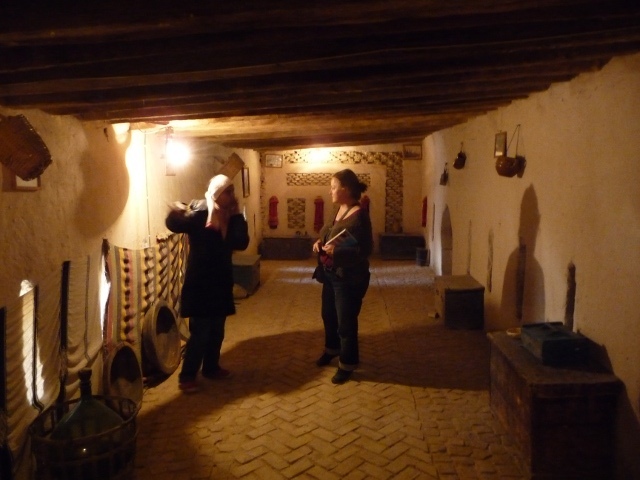 Saoud, our guide around, was wonderful – her infectious enthusiasm shone through in everything she explained – usually including singing or reciting her own poetry, as she switched seamlessly between Arabic, French and English. Just around the corner, we found a slightly ramshackle street stall, selling the utterly delicious Tozeur speciality, Metabka – “Berber Pizza” – two fresh unleavened round breads, the dough filled with a mix of Harissa and chopped vegetables, and sealed together before cooking on a hot griddle not unlike those of a French creperie. We’ve had them before – our first taste was on Kerkennah – but these were definitely the best (and hottest!) yet. We’ve been lugging the bikes around Tunisia on the back of the van, only using them lightly and intermittently, until now – they proved invaluable in exploring the oasis and palmerie, and beyond into the salty scrubland on the edge of the Chott. Compared to the one in Douz, this seems much better kept – the palms look healthier, and there’s a greater variety of plants growing, including banana trees. Deep in the middle of the oasis, there’s a statue of Ibn Chabbat, who in the 13th century drew up an irrigation plan so fair in the distribution of limited water that the French colonists were reprinting it in the 20th century. To this day, he’s clearly a good chap to rely on for slaking your thirst on a hot day – because right opposite the statue was an extremely pleasant cafe, spread through and under the shade of the trees. To the east of Tozeur lies Nefta, close (no more than about 30km) to the Algerian border. The old quarters lie centred around the Corbeille, a sunken crater filled with palms slap bang in the centre of town. Old mosques and shrines teeter precipitously on the rim after disastrous flooding in 1990. A centre of Sufi Islam, these old quarters are full of small and twisting back streets, dotted around with many religious buildings. 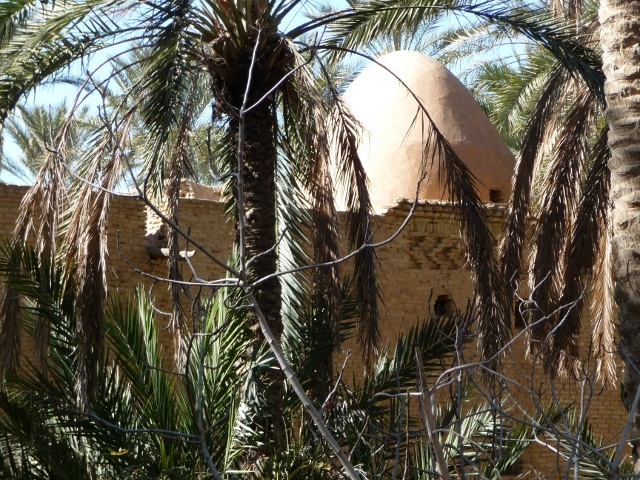 As with Tozeur, the town’s Chott side has a large palmerie – and, again, many small and picturesque domed marabouts punctuate the trees. 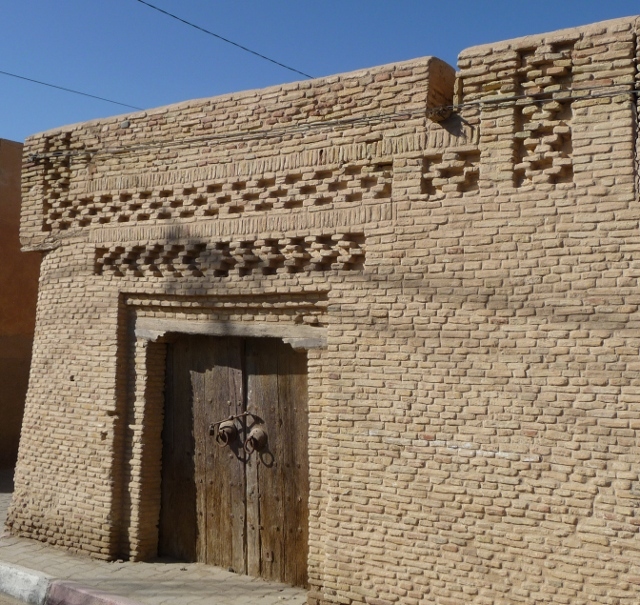 A pleasant town to walk around and just enjoy the scenery, with one of the quarters having decorative brickwork similar to that in Tozeur – apparently, the protrusions are not merely for appearance, but help to create cooling air draughts due to convection and the patterns of shade. However, it did have a slightly more persistent undercurrent to the surface friendliness – we had the driver of a horse-drawn caleche follow us up the road trying to persuade, cajole and browbeat us into using his services, whilst a conversation struck up over a cup of tea in a cafe quickly turned into an interview with a potential guide… At the local house-museum, though, there was no such pressure – we were shown around the courtyard and suites of rooms, including granary attics and secret hiding-place for anti-colonisation insurgents, before sitting in the sun with the inevitable mint tea… Some of the rooms were also available for B&B. Very tempting, but we managed (somehow) to resist.